goodies are in Susan's Closet! 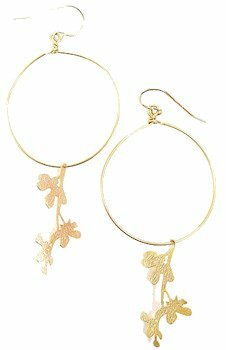 Simple gold hoops work equally well with casual attire or a more dressy ensemble. Gold wire earrings with hoops and dangling matte gold branch charms. Made in USA. Polish with a soft jeweler's cloth. Please note that earrings are non-returnable. Guaranteed authentic, 1 available.